1 Out Of 3: Why My Husband Shouldn't Pick My Swatches! 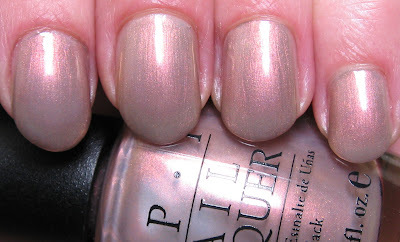 Above & Below: OPI's Nutcracker Sweet is the one shade I loved that my husband chose for me to swatch. He didn't do so well with his other 2 choices! It's a taupe shimmer with a pink and copper flash. Interestingly, when I removed this shade, the colors on the cotton ball were what looked like a dark taupe creme and a bright copper foil. Below: Gargantuan Green Grape is a light Lime green shade, but it's a bit too yellow-toned for me. That, combined with having to use 3-4 coats and the thick formula this one had, make it less than desireable for me. You can see what I mean about the thickness if you look at the mess on the tip of my ring finger. Below: My husband not only chose these shades, he also chose the prop. Clearly, he need help! Below: Coney Island Cotton Candy had a very thin formula, although I do like the subtle look of this shade. Look at all of those bubbles in the bottle...maybe that's why it was 75% off? Last night I was swatching some of my new American Apparel polishes I showed you yesterday, when my husband walked in and wondered why I wasn't using something off of my untried shelf first, so I'd have room to add the AA polishes. He seems to think that's how it works! I asked him which ones he would choose, so he picked out 3 OPI's I've had for a while. Yesterday, China Glaze posted a Tweet asking how our significant others felt about our nail polish habit, so that, tied in with my husband interfering in my swatching, gave me the idea for this post! Mike chose 2 shades that I picked up this summer at our local Regis salon, Gargantuan Green Grape and Coney Island Cotton Candy, for 75% off. Neither one are my favorite shades, but for 75% off, I couldn't pass them up. After using them, they're still far from my favorites, mainly because of the streaking and the formula. GGG is a more yellow-toned light Lime green shade, and the formula was quite thick, as you can see in the photos. My husband really liked it though, once I had it on, but he wasn't the one fighting with the formula! Coney Island Cotton Candy had the opposite formula: thin and runny. No matter how hard I tried to use a minimal amount on the brush, I still ended up with a lot of pooling at the cuticle. It's a very simple shade, but I do like the color. The third shade he chose was definitely more my style. Nutcracker Sweet was included in one of my swaps from the lovely Helen, of Helen & Sheenie's Nice Things blog. I had commented on her post about it, and she knew how much I liked it on her, so she sent it to me. How kind of her was that? This shade is a moderate duo chrome with a taupe shimmer base and pink with copper duo chrome flash. I used 2 coats on this, but I think 3 would have been a better idea. No matter, I love this one, and thank you Helen, for sending it my way. My husband is actually very supportive of my nail polish habit, which gives us one less thing to argue about! He picks up polishes every now and then for me, tells me what he likes and doesn't like, and builds more shelves when I start running out of room. He never says anything about the amount of polishes or makeup I have, even though they seem to multiply weekly. But I do think he should stick to his construction work and leave the swatch color picking to me! How does your significant other react to your habit? Haha! At least your other half takes an interest, I think that's really nice! lol Ryan actually pays attention to colors I like and picks things up every now and then. The only time he rolled his eyes was my bidding war for SSN. The last polish is definitely my favorite of the 3. Yummy, soft shades. :) I can't explain the bubbles, though! Mine is pretty OK with it. He likes that I have something I love and that makes me happy. He also occasionally buys me polish or checks the local ds when he walks by to see if that polish he knows I've been waiting for has come out yet. He is the one that suggested I get a light box when I was complaining how hard it was to take good pics for my blog in winter. He doesn't like the smell of remover and fresh polish but he doesn't complain about it very often. My boyfriend only comments on my polish when I'm wearing bright blues, in which case he says, "Looks cool." SHOCKINGLY, the other day I was wearing Good Witch? which I ended up hating, and he said, "Hey, that looks really, really nice." I was so surprised. I guess I can't throw that one on the scrap heap. My boyfriend doesn't mind my habit as long as they're not all over the place. Sometimes I let him pick out shades for me, and he tells me when he REALLY loves a shade (like RBL Stormy). Now, my mother is coming to visit in 2 weeks, and while she knows how many polishes I have, I think seeing them in person will still be a shock for her. That Nutcracker Sweet looks a gazillion times better on you than it did on me. SO glad you like it. In fact, I looked at it and thought "That's lovely, I need one of those" before realising what it was and realising how it wasn't the right tone for me. Ahhh - polish finding a new and loving home makes me all warm inside! Your husband sounds sweet Mary! You mentioned that he has built you shelves - ooooh please take pictures for us to see with all your pretty polishes on!! I've only started my collection and I blogged about my (small) stash that fits inside a drawer. I'd love to see your custom made shelves!! My husband humours me in that he lets me talk excessively about nail polish and nail polish blogs - despite the fact it's probably boring as hell to him. He doesn't like the smell of the remover, so I remove in a different area, then come back near him to paint. He's never made any comment about what colours he likes - just the ones he isn't too keen on. He's not keen on colours like lime green, and bright purple. Seems he likes the more 'traditional' dark hues or creamy pastals simply because I haven't heard any comments when I wear those. He hasn't bought me a polish yet but is with me when I buy them and happily points out my fav discount cosmetic store when we are road tripping (even when I've missed it!). He seems to be ok with the fact that by the end of 2010 I should have quite a collection. As long as I don't buy them all in one order hehe. My husband is mainly happy that it makes me happy. He does like some of the colors I pick, especially the bold and shiny ones (my favorites, too). Then again, I'm not blogging about polishes so I don't have a collection of quite the same order of magnitude that others have! What a sweet guy Mike is! Plus he can build shelves for your polishes. That's one great guy. Ever tried to get him to wear the BB Couture Men's Collection? I love the Nutcracker Suite. Looks lovely on you. The GGG I also like but it's a shame that it's so thick. The last one would make a good French manicure base. Helen cracks me up that she "needs one of those"! I think we're all a bunch of crazies. In a good way of course. Those all look so gorgeous! I made the mistake of letting my husband pick my mani once! It was fun. :) It was crazy stripes..
Do I see BROBEE!!! :) I love yo gabba gabba! actually i like the 2 out of 3...i wouldn't buy them, the formula looks terrible, but the colours are so nice.. I think that that is so sweet that you let your hubby select the polish shades and swatches; keep the family involved! I do like Nutcracker Sweet & Cotton Candy, however I agree with you on the Green shade, it's not as cute. And hate thin polishes with thick formulas. It's like a juxtapose. Anyhow, cool idea Mary. krisprimps~that's great! I always feel been when gals have so's who don't support their habit! Ange-Marie~another great one! Mike doesn't ask about prices, which I'm glad about. Nathalie~I really like that shade, it's so subtle. But such a strange thin formula. I don't guess they make polish thickeners! Kirsten~yes, Mike thinks if I'm happy he's happy, so that's a good thing. He does comment on the smell sometimes, but I just ignore his comments! Denny~keep working on him, he'll buy you some! Stephanie~that's nice that he notices though and gives you his thoughts. Kelly~my parents (my Mom's gone now, sadly) were always great about it. They figured if it made me happy, it was good. My Dad is always up for listening to me talk about polish, but I think he's just being nice! Aaren~glad that he's supportive! Hopefully your Mom won't be too shocked! nihride~I wanted to like it, it looks nice on others. But the shade just isn't gettin' for me, you know?!! Helen~it has a happy home with me now, thank you! I'll eMail you about guest blogging, yay! Hannah~hmm, sweet? I don't know about that! He is a very good person though, that I'll admit. I use standard shelves bought at the store, but they only come with a couple of shelves, so he builds me more of those to match. I'd love to have a custom cabinet made just for polishes, and I'm sure he could build it...maybe someday! I'm glad your husband is good with your collection. That makes it easier! TropicalChrome~Mike seems to have different taste is colors than I do, but that gets me out of my comfort zoone and makes me wear some shades I may not wear otherwise. Lucy~I asked him about the BB Coutures...I mean they have all those tool names and he's all about tools! But that was a big no! And yes, we are crazies! gildedangel~thank you! Some are nicer than others though, Nutcracker Sweet! Liz~yes, Mike picks out very different things than I do, but that's alright! Brobeeeeeee! hitomi~I know, I was disappointed, because they looked better in the bottle. Krystia~yep, one big happy family (some days!). Those were my two favorites of these also. No complaints on Nutcracker Sweet!